If you can't leave home without your four-legged family member, there are lots of choices in the International Drive Resort Area that will cater to your pet while you visit! Orlando was recognized for its pet-friendly atmosphere when it was named among AAA's "Top 10 Most Accommodating Cities for Pet Travelers" and DogFriendly.com's "Top 10 Dog-Friendly Destinations in the U.S. and Canada." Not only do many I-Drive properties welcome your pet with open paws, they also offer amenities and services that make them feel at home. The International Drive Resort Area, rolls out the welcome mat for pets and their animal-loving owners! There is something available for every budget from resorts to value-priced properties. 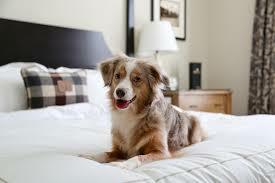 Be sure to check specific accommodations for price and requirements when traveling with your pet. With many hotel providing accommodations for pets (keyword: pet-friendly), it is important to confirm with the property at time of booking that they still accept pets as well as any restrictions that may be applied. Be sure to ask about deposits and if proof of current inoculations is required. Heading to the theme parks? SeaWorld Orlando Kennels are located just outside the main entrance and will board family pets for the day. Owners should provide food and are responsible for walking their pet throughout their stay at the park. Visit seaworld.com/Orlando or call 407-545-5550. Universal Orlando Resort also offers daytime kennel boarding. Located in the parking structure, the kennel closes two hours after the last park shuts its door for the day. Guests must provide food and return periodically to walk their pet. Check here for details or call 407-224-9509. Check with specific accommodations to make sure they are “pet friendly.” Ask about extra charges for your pet to stay in your hotel room. Inquire about rules for leaving your pet alone during the day. Ask about areas for walking. Visit the vet before your trip and pick up inoculation records. Many accommodations will require them. Ask your vet to recommend a vet in the area you will be traveling and make a note of the phone number. Make sure your pet is wearing identification that includes: pet's name, your name and address and a phone number. Make sure it is a cell phone and not your home phone. Bring items that are familiar to your pet: a pet bed, blanket, favorite toy and their favorite treats to help them feel comfortable in unfamiliar surroundings.